On October 28, Rogelio Velásquez and Saúl Méndez went before a judge in Quetzaltenango, commonly known as Xela, Guatemala’s second largest city. The two community leaders from Santa Cruz Barillas faced charges of femicide for their alleged participation in the murder of two women in 2010 and 2011. By late afternoon, the judge had come to his decision: The two were acquitted of the charges. 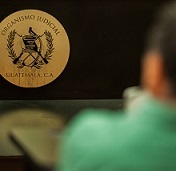 Photo: Domingo Baltazar sits before a Judge in Guatemala (Credit: Jeff Abbott). Méndez and Valásquez have been active members and leaders of the defense of territory in northern Huehuetenango. The community of Santa Cruz Barillas has been in resistance to the Santa Cruz hydroelectric project under construction by the Spanish firm Ecoener Hydro Energy. They argue that the dam will greatly affect their land and water. In 2010, the community declared their resistance after they held a community-wide consultation. They argue that they were never consulted by the company on the project prior to the issuing of permits, despite the legal requirements of not only the Guatemalan constitution, but Convention 169 of the International Labor Organization’s declaration on the Rights of Indigenous Communities. Since then, Méndez, Valásquez, and other community leaders have faced intimidation and assassinations for their resistance. In May 2012, the administration declared a state of siege in the rural communities of the municipality of Santa Cruz Barillas, Huehuetenango, where the indigenous communities have protested the construction of a hydroelectric project owned by the Spanish firm Econcer Hydroelectrics. Hundreds of military and police were deployed to the communities, and more than 70 orders for arrest were issued for the leadership of the movement, including Méndez and Velásquez. Méndez and Valásquez were detained in August 2013 on allegations of their involvement in the murder of two women. Despite the accusations, they remained incarcerated without official charges until 2015. The case finally went before the Femicide Court in Xela in September. The court’s decision, however, does not mean that the two will be released just yet. There remains a case in Guatemala’s Constitutional Court that needs to be resolved. But despite this, the decision to acquit these two political prisoners represents a major victory for communities that have faced criminalization for their defense of their territory. Femicide, which is defined as the murder of a women by a man in the context of unequal power relations, has been a major problem in Guatemala in the years since the end of the internal armed conflict. According to data from the Washington D.C. based, Guatemalan Human Rights Commission, cases of femicide rose from 213 cases in 2000, to 720 cases in 2009. Guatemala’s femicide laws were passed in 2008 during the administration of Alvero Colom, and represented a major victory for holding men accountable for violence against women. By passing these laws, Guatemala became on the second country in Central America to pass such laws. The first was Costa Rica in 2006. But since 2008, only 2 percent of cases have led to a conviction, leading many to argue that there remains a culture of impunity around violence against women. But this manipulation is part of a larger campaign of criminalization of social movements in Guatemala. Increasingly, activist and communities that protest the extractive industries in Guatemala have faced criminal charges. The interior ministry and firms have used false charges of “kidnapping,” “illegal sequestering,” “terrorism,” and the draconian charge of “intent to commit a crime” to exhaust the leaders of social movements. Three other leaders, Adalberto Villatoro, Francisco Juan y Arturo Pablo, were arrested in February 2014. The following month, Rigoberto Juárez and Domingo Baltazar, were arrested as they walked through Guatemala City. And most recently in May 2015, another leader from Santa Cruz Barillas, Ermitaño López, who is affectionately referred to as Don Taño, was arrested as he attended a hearing for three other men who were arrested in February. All face charges for their alleged participation in the sabotage of machinery, kidnapping, and the intent to commit a crime. According to lawyers involved in the defense of movement leaders, these charges have become increasingly worse, and reflect the manipulation of the country’s laws by the companies in order to criminalize and exhaust the movements that challenge mega-projects. According to Morales, the document was prepared by representatives from the Spanish firm, Ecoener Hydro Energy, and then issued by the Public Ministry. The document has since been used against the leaders of the movement in their trials. The criminalization of social movements extends well beyond northern Huehuetenango, and impacts all movements in defense of territory. International organizations such as OXFAM and the Guatemalan Human Rights Commissions, and others have increasingly raised concern with the use of criminal charges against leaders of community movements, and human rights defenders. In early 2015 OXFAM issued the report ‘We Only Want To Be Human,’ which highlighting cases of leaders of the social movement and their supporters. Other organizations such as the Guatemalan Convergence for Human Rights, an alliance between Guatemala based human rights organizations, has also highlighted the deterioration and criminalization of community leaders. In early 2015, they too issued a report on the criminalization of human rights defenders. In their report, they associate the increased criminalization of human rights defenders with the state’s change in the definition of human rights defenders. This change is reflected in data from United For the Protection of Defenders of Human Rights, which is a member of the Convergence for Human Rights. According to their data, attacks on human rights defenders have steadily increased since the election of president Otto Pérez Molina in 2012. That year, they registered 305 aggressions against human rights defenders. By 2014, the number had skyrocket to 805 attacks. But like the case of Velásquez and Méndez, not all criminal charges against the movements have led to prison time. In some cases, the judge can acquit the leaders of the charges that they face. Since 2012, the communities of San Jose del Golfo and San Pedro Ayumpuc have maintained a permanent blockade of the entrance of the El Tamblor gold mine, which is owned by the Reno, Nevada based Kappes, Cassidy, & Associates (KCA). The “La Puya” resistance fears that the mine will significantly pollute their water and land. In September 2013, legal charges were filed against 12 of the leaders of the movement for alleged “illegal detention” of workers, “coercion,” and for “threats” against workers from the mine. The 12 defendants had been involved in the alleged kidnapping of workers from the mine. 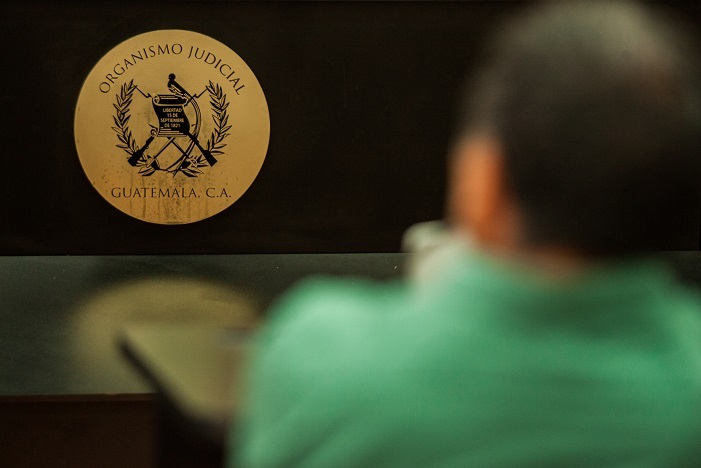 On February 27, 4 of those facing charges went before Judge Elvis Hernández of the 8th Criminal Court in Guatemala City, who proceeded to acquit the defendants from La Puya, a small victory. But despite this small victory, the community is still on edge. Members fear that more false charges could be brought against them at any time. This threat contributes to the campaign by the state and business against the communities in resistance.